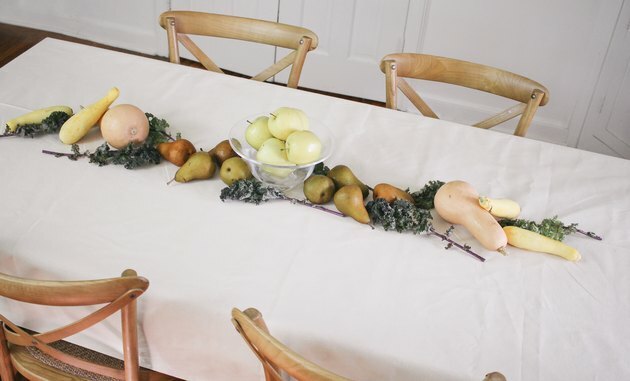 Give thanks in style with a swoon-worthy edible table runner that takes the cornucopia concept to the next level. While a festive floral centerpiece is always a solid choice, this year you might want to try something different for your holiday table. 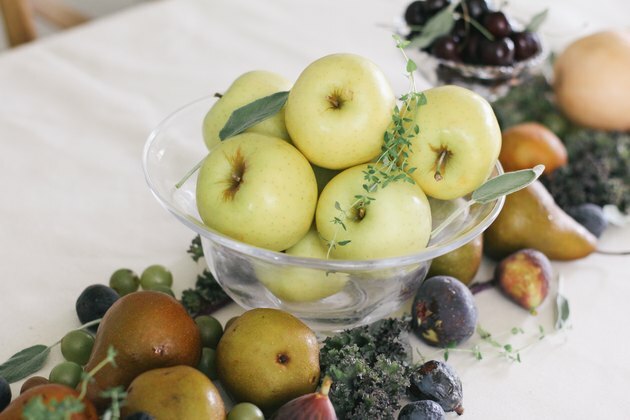 With an artful abundance of harvest crops, you keep the focus on the beautiful bounty of the season. 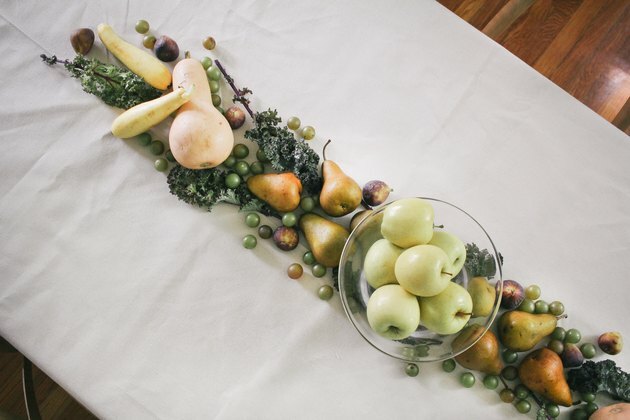 Food is, after all, the star of Thanksgiving — and with a still life-inspired table runner that pulls double-duty as elements of the meal, you certainly set the scene for a fine feast with family and friends. Step 1: Choose a color palette. 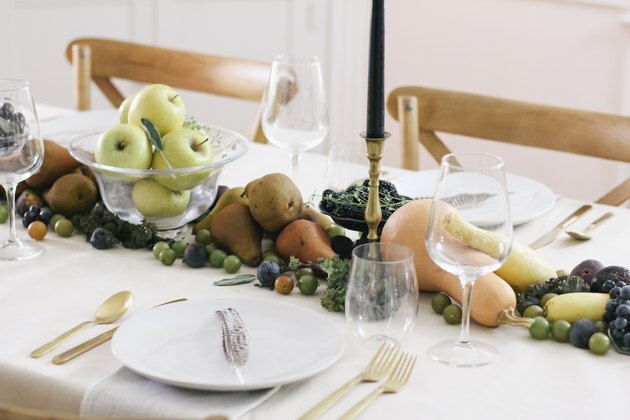 We let the muted mustards and earthy taupes in these autumn leaves inform the color story for our table runner, opting for yellow-toned apples and squash as well as brown turkey figs and Bosc pears. 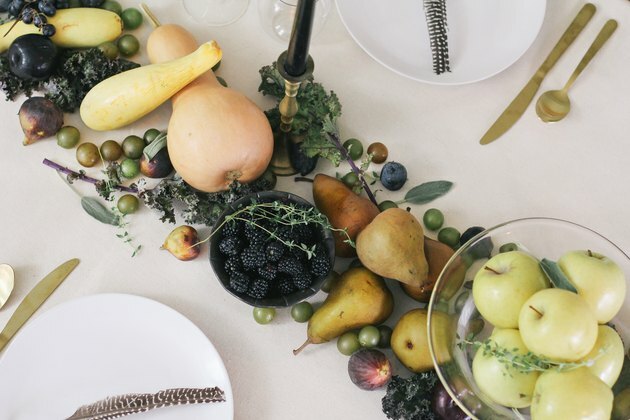 To add a bit of moody contrast, we selected accent fruits with dark purple and burgundy undertones like blackberries, purple kale, and black mission figs. We tempered everything with soft pops of green from muscadine grapes and fresh herbs. Step 2: Create a blank canvas (literally). Skip the stuffy formality of starched linens and opt for a more casual, unpressed look. 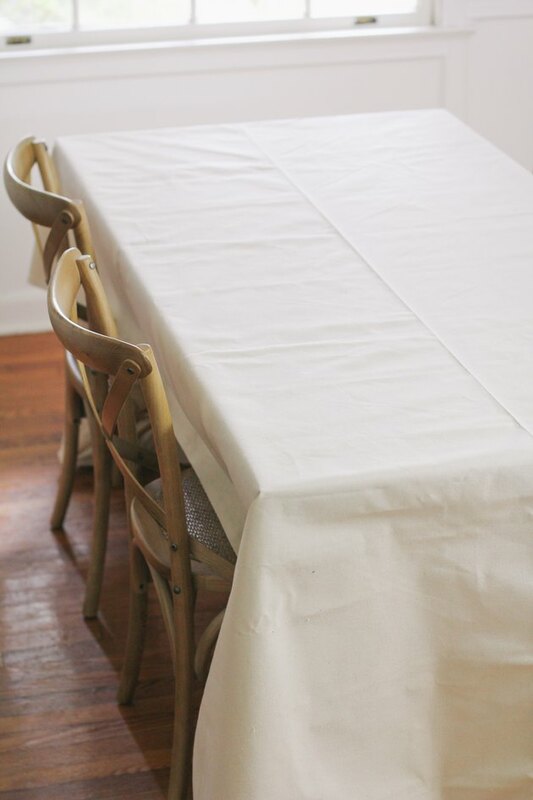 Lest you worry about the edibles staining your fancy tablecloth, do as we did and use a canvas drop cloth instead. It provides a literal blank canvas, and the wrinkly, imperfect fabric matches the natural, organic feel of the fruits and vegetables. Step 3: Start with a centerpiece. 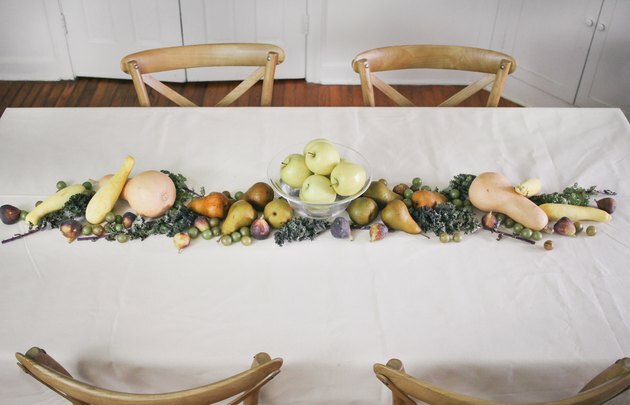 Create a clear center for the table runner by placing a bowl of fruit in the middle of the table (we used golden delicious apples). 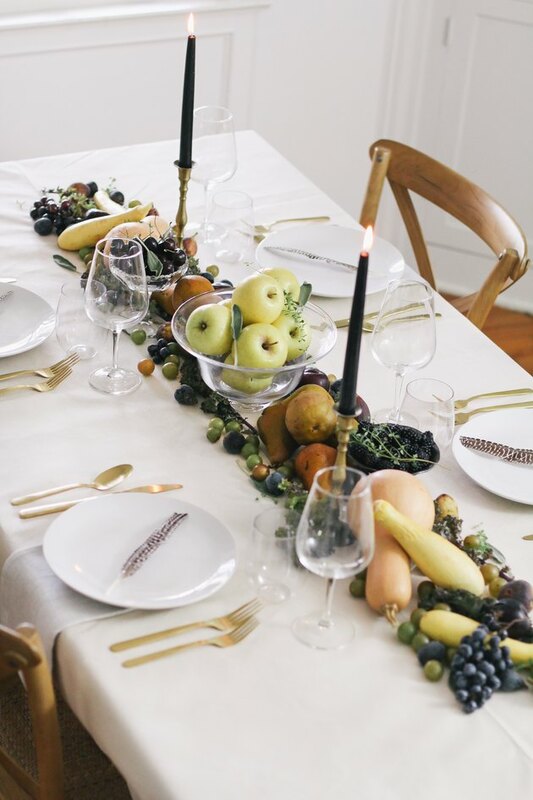 By keeping it all the same fruit, the centerpiece offers a single burst of color, and the glass pedestal bowl adds some height to the center. Step 4: Build outwards from center. 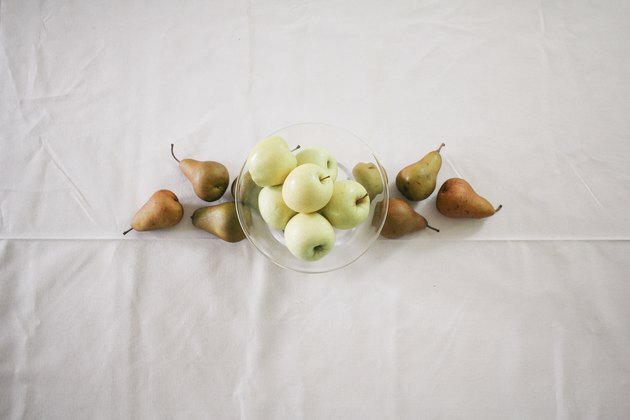 Place a different type of fruit or vegetable with a different shape and color tone on each side of the centerpiece. The sides don't have to be mirror images, but aim for a balanced look. 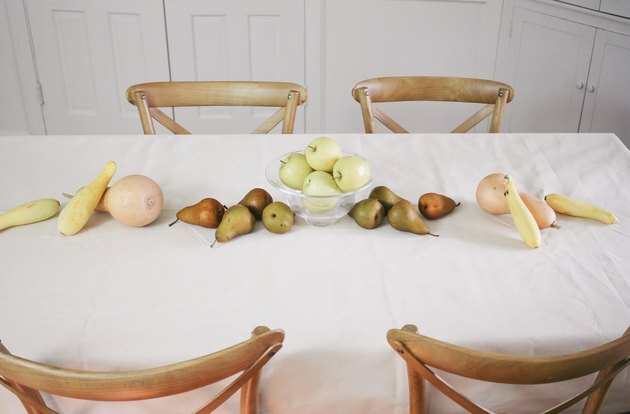 Vary the size, shape, and color of items as you place them down the length of the table. At this point, you'll want to use your bulkier items, so you can fill in with the smaller items later. Again, place things fairly symmetrically to keep the runner feeling balanced on both sides. 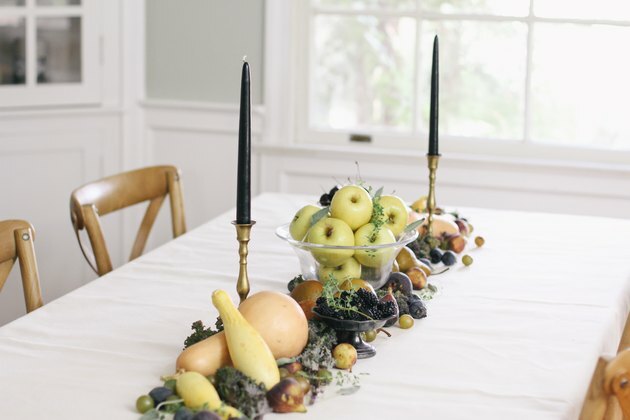 You'll notice we placed the same amount of pears, butternut squash, and yellow squash on each side of the centerpiece. Step 5: Create texture and contrast. We weaved single leaves of purple kale throughout the arrangement to fill in the blank spaces. The dark leafy roughage adds volume and texture as well as much-needed contrast to the pale, muted hues of the fruit and vegetables. 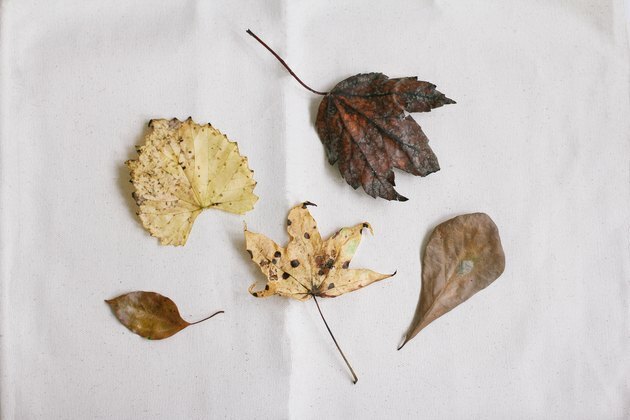 Pro tip: Take care not to use too much leafage here, or you risk your runner resembling a salad bar more than a chic tablescape. 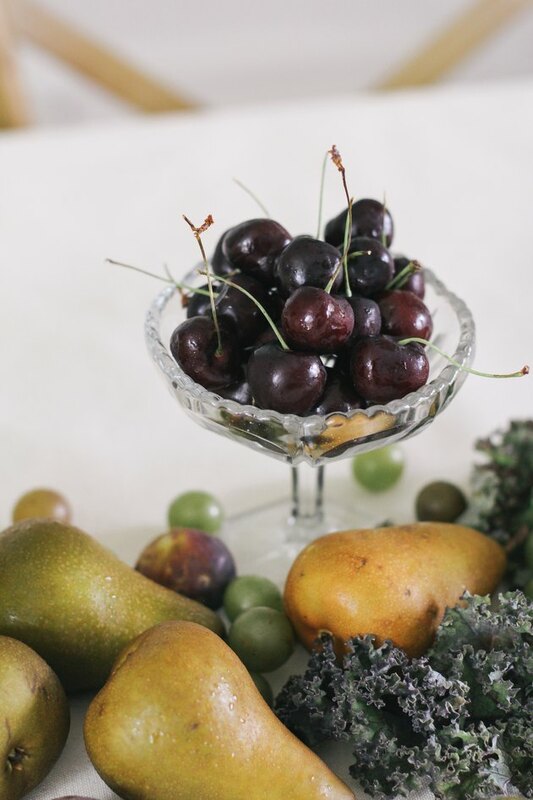 Build the feeling of an abundant harvest by piling smaller fruits in between the larger ones and tucking them throughout the leafy greens. For this step, we used loose muscadine grapes, brown turkey figs, and black mission figs. Nothing should be placed too perfectly, and there are no straight lines here. We're going for a natural "just spilled out of the basket" vibe with loose, undulating lines. Be sure to keep the colors varied and balanced throughout the length of the arrangement so there aren't any areas that feel weighted by one color. Step 6: Vary the heights. Create some vertical interest throughout the length of the runner by using vessels of varying heights. 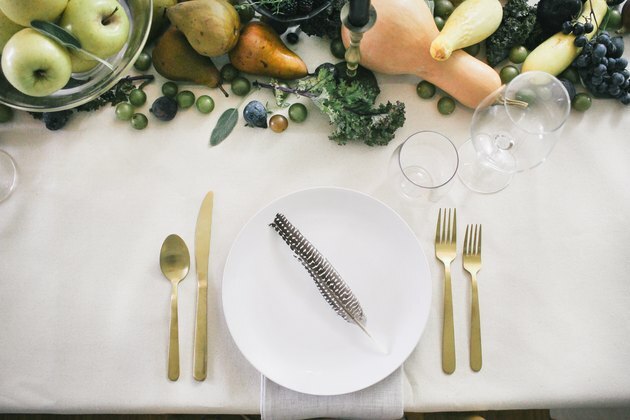 Clear glass or metallic finishes work best to not distract from the colors of the fruits and vegetables. 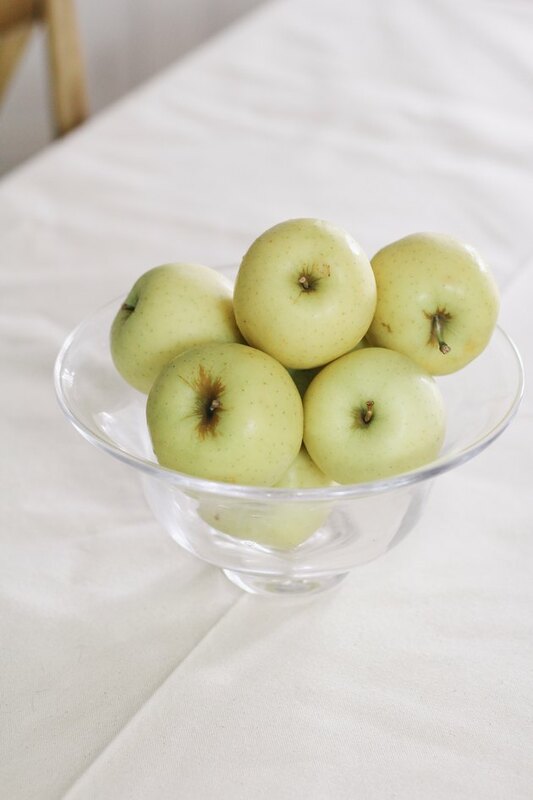 They are also great for displaying any particularly juicy items that are prone to stains or stickiness like long-stem cherries or blackberries. Step 7: Scatter loose herbs. To keep the table runner from feeling too neat and tidy, scatter loose herbs throughout to add a bit of wild unruliness to the scene. Plus, they perfume your tablescape with wonderfully herbaceous notes. 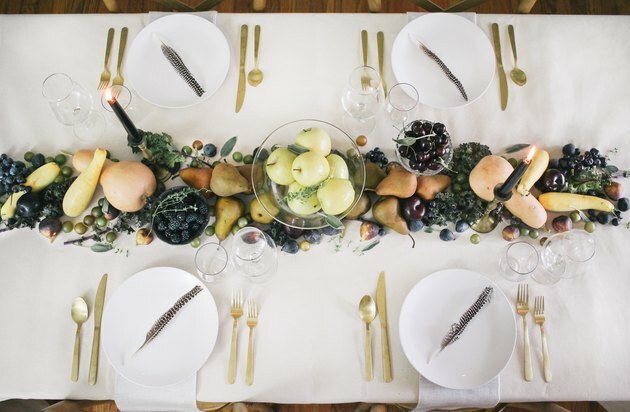 We used fresh sprigs of thyme and loose sage leaves here, tucking them in between various fruits and softly dropping them down the length of the table. Step 8: Create glowy vibes. Dinner is so much cozier with candlelight, right? Tuck a couple of candles on each side of the table runner to create some glowing mood lighting. We used brass candlesticks to add a metallic accent with vintage vibes and black taper candles to contrast with the cream-toned fabric. Step 9: Put a feather on it. 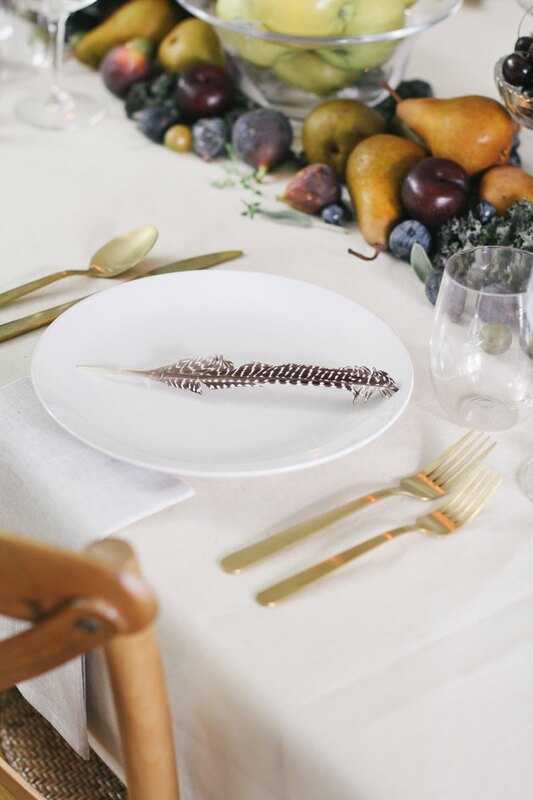 As a plucky ode to Turkey Day, we placed a single feather on each guest's plate. To keep the color focused on the table runner, we used white plates, light linen napkins, and clear glasses. 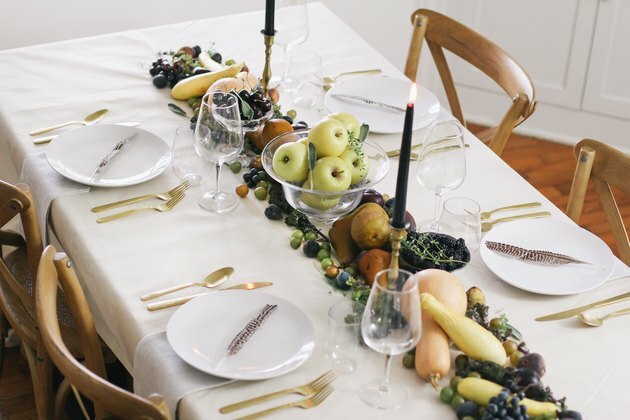 Gold flatware plays nicely with the metallic notes of the candlesticks for a modern touch. So easy, so elegant, and quite literally good enough to eat. 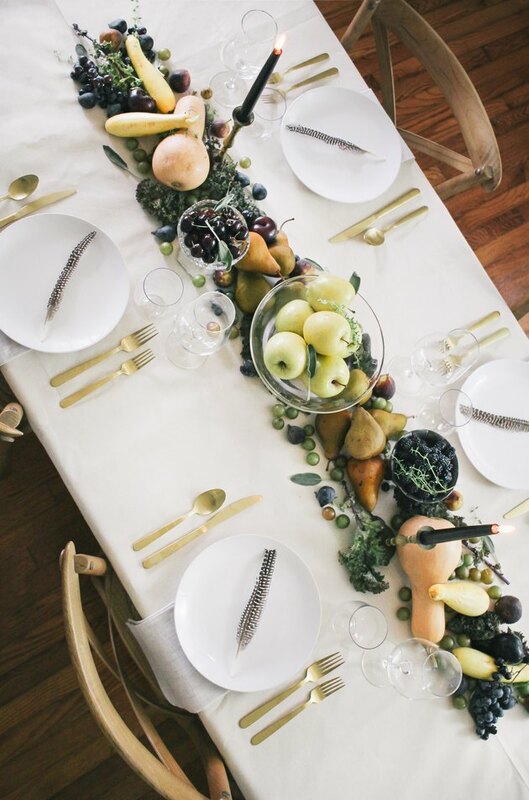 Seated around such a stunning table adorned with autumn's splendor, your guests are guaranteed to feel nothing but gratitude.